Hercule Poirot has never doubted his abilities - until one day a parallel is drawn between him and his namesake the great Hercules of Greek lore..... To live up to (or in his own mind surpass!) the glory of Hercules, Poirot decides to take up the famous labours that the Greek hero went through. The twelve stories that follow are all that an Agatha Christie fan could wish for. 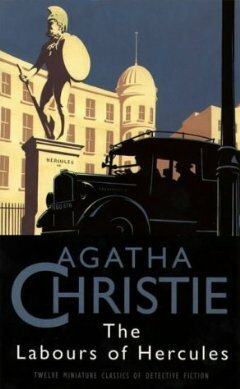 The novel contains some of the most famous characters in the Christie universe including Inspector Japp and Countess Vera Rosakoff. I enjoy this novel each time I read it because it has some of the simplest and sweetest stories Christie has written. Among them is The Arcadian Deer which tells the story of a young, handsome mechanic who is searching for the woman he fell in love with, The Augean Stables which concerns the reputation of a good and honest politician (really! ); The Labours of Hercules also introduces the character Amy Carnaby - a timid old lady's companion who turns out to be something more. Of course there is also the final reappearance of Poirot's one and only flame Countess Vera Rosakoff. Now old and retired from a life of crime, in Poirot's eyes, she still has more fire than all the girls of the younger generation! All in all, reading these stories passes a fun couple of hours. This was pretty fun in its setup, though a lot of the short stories weren't up to par with the twists she has in her other short story collections.